The Conservancy is thrilled to announce volunteer opportunities for adults, youths, and families! We want to help you create friendships, visit beautiful places, and learn job skills in science, journalism, and gardening -- all while serving your community. Check out our opportunities, and fill out the form below to sign up or request more information! The Hearts & Spades Community Garden (sponsored by the LFVC) will have seedlings for sale this spring-stay tuned for a sale in May! A $25 donation secures you a 4' x 8' raised bed topped with rich soil, with water paid for by a generous donation from the Town of Lake City. Our seedling sale raised money to buy learning gardens for Wee Care and Lake City Community School. These plots will be turned into living laboratories for families and students of all ages, who are invited to participate in a summer growing program that teaches biology, horticulture, and that dirt don't hurt. In 2015 the LFVC will be revamping it's Colorado River Watch water monitoring program! Stay tuned for more info on trainings in the spring! Click here for more information on our chapter of Colorado River Watch. The last bit of work to be done under Phase I of the Lake Fork River & Henson Creek Enhancement Project is to plant trees along the banks! 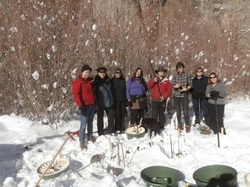 We will be calling volunteers as soon as the snow has melted enough for us to get planting! Please contact our Education & Outreach Coordinator, Stephen Norton, at s.norton@lfvc.org or 781.454.7667 if interested in volunteering!